Back Row: Murdo Armstrong, Ronald Garson, Alice MacLeod, Willie Bisset, Hamish Sutherland, Ian Clark. Middle Row: John Craig, John Campbell, Arthur MacKenzie, Eddie Benson, Ian Dingwall, Ken MacPherson. 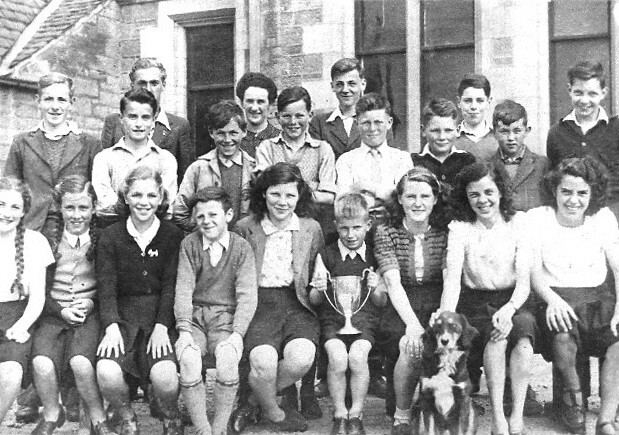 Front Row: Anne Craig, Rhoda Butter, Violet Campbell, Justin Calder, ?, Donald MacLeod, Vera Innes, Sheena MacKintosh, June Gordon.